A "tax bankruptcy" may be a good way to get rid of old tax liabilities without paying a cent. As our tax litigation attorneys have discussed, certain tax debts including income taxes can be discharged in a Chapter 7 bankruptcy. However, if you have significant assets, you can expect those assets to be sold and turned over to the IRS or other creditors if you filed for bankruptcy. For those with assets and a legitimate dispute as to whether or not they actually owe the tax asserted by the IRS or a state taxing agency, bankruptcy is an opportunity to have a judge decide whether or not those debts are truly owed, without having to pay the tax debt up front. For example, assume the State Board of Equalization (SBE) was to determine that your business owed $500,000 in taxes and the SBE refused to accept your explanation as to why its determination was incorrect. Perhaps the SBE even imposed a tax fraud penalty amounting to an additional 25% of the taxes. Normally, the only way that you could get a judge to hear your case is to pay the full amount of the tax the SBE claims to be due, file a claim for refund, and then and only then, can you file suit in California State Superior Court asking the judge to return your money. What if you didn't have $500,000 to pay before you had your day in court? Or maybe you have better things to do with your spare funds rather than giving it to the government for taxes that you may not even owe. Instead, you or your company could file a bankruptcy. The SBE might file a proof of claim in the bankruptcy court stating that it was entitled to be paid. As your tax litigation attorneys, we could then file an objection to the proof of claim. At that point, the Bankruptcy Court judge would have jurisdiction under Section 505 of the Bankruptcy Code to decide if you actually owed the taxes. or administrative tribunal of competent jurisdiction. Even though it might seem that bankruptcy courts have jurisdiction to hear any tax claims not all bankruptcy judges agree. For example, in Swain v. United States (In re Swain), the court held that § 505(a) is not an independent grant of jurisdiction to bankruptcy courts. 437 B.R. 549, 562 (Bankr.E.D.Mich2010). In United States v. Zellers (In re CNS, Inc.), 255 B.R. 198, 201 (N.D.Ohio 2000) the court came to a similar conclusion. Nevertheless, the majority of bankruptcy courts have found jurisdiction for making the responsible person determination for the debtor in a no asset Chapter 7 case and have either made the determination or abstained from making the determination. For example, in Donoff v. United States (In re Donoff), 1999 Bankr.LEXIS 144 (Bankr. S.D.Ohio Feb. 5, 1999), the court held that it had jurisdiction over determining whether someone was a responsible person for the purpose of the trust fund recovery penalty. Cases involving the imposition of a tax fraud penalty are particularly good candidates for a hearing before the bankruptcy court. In the experience of our tax attorneys, the IRS and the California State taxing agencies such as the State Board of Equalization, the Employment Development Department (EDD), and the Franchise Tax Board (FTB) sometimes impose tax fraud penalties without sufficient evidence. Generally, to impose a tax fraud penalty they must be able to prove by clear and convincing evidence that there has been a fraudulent tax return filed. These penalties are often imposed by individuals who are not tax attorneys and therefore may not fully understand how difficult it is to prove tax fraud. By bringing these cases before a Bankruptcy Court, there is an opportunity for a judge to review the penalty and in many cases, overturn them. The Bankruptcy Court allows the opportunity for discovery, the presentation of witnesses, and a trial. Alternatively, simply the threat of a trial may bring the IRS or a state taxing agency to be more reasonable in negotiating a settlement. While a bankruptcy attorney can file a bankruptcy petition on your behalf, you will need a tax litigation attorney well versed in both substantive law and tax procedures to navigate your way through litigating a tax dispute. Filing for bankruptcy can be a powerful weapon. 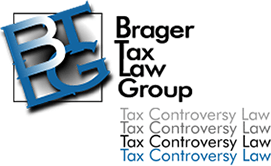 If you would like to find out how a tax bankruptcy might be helpful to solving your tax problems, please call our office to arrange a confidential consultation with our founder tax controversy attorney Dennis Brager.